All around the country, new students are realizing that college can be an exciting prospect, but one also tinged with apprehension. Freshmen can often find themselves confronted by a dizzying array of questions ranging from the simple need to find their lecture rooms to making new friends to choosing their class schedules. Easing the transition into their new college life and providing incoming students with all the resources that college life can offer is the goal of orientation programs colleges offer throughout the summer. 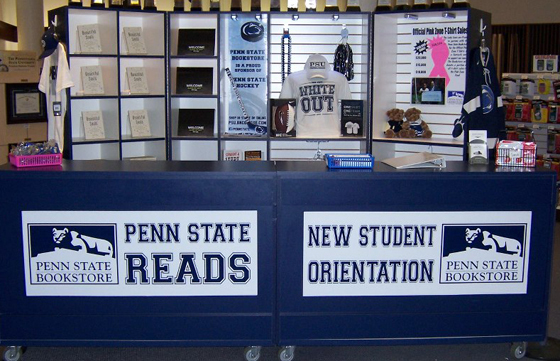 The Orientation Counter in the Penn State Bookstore, where new students can pick up their copy of the “Penn State Reads” book, peer-to-peer introduction to bookstore services, as well as information about the campus and its facilities. That level of communication is also appreciated by Kellie Wright, store manager at the University of Tennessee at Chattanooga UTC Bookstore. “We work with our campus orientation leaders before orientations begin, and we hold breakout sessions in the store to talk about our different programs. It’s a tremendous help in spreading the word, and students and parents really appreciate the information we provide,” she maintains. With 2,300 students arriving on campus, and with seven separate freshman orientations over the summer, spreading the word is something they do well at Chattanooga, and three years into its textbook rental program, the results are impressive. “Last year alone we saved our students a million dollars between rental and used textbooks, so they look to us not just as the bookstore, but as a resource where we can explain the different textbook options that are available and can save them money right here on campus, without concerns about whether they’re ordering the correct book or the cost of shipping,” Wright adds. As members of the class of 2017 settle in to their new surroundings, campus administration and bookstore managers have already begun the process of educating students about their academic choices, but also to acquaint them with student life and bookstore services. To help with this process, all incoming students across Barnes & Noble College’s 700 campus bookstores have received a Welcome Kit designed by the experts who have been there before – other students. 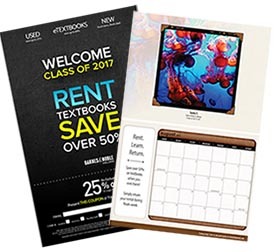 The Welcome Kit features a keepsake 18-month wall calendar with photos sourced from students across the country, alongside important information and reminders about textbook rentals, cash back and special offers. 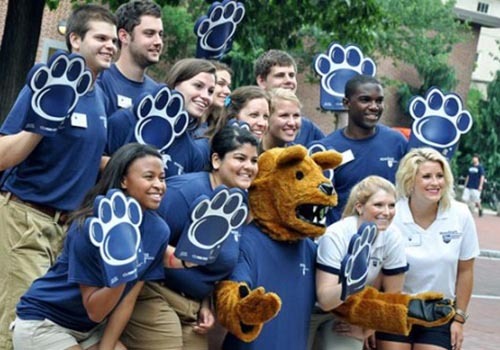 Campus leaders and tour guides also distribute information and coupons to welcome new students and their parents, and to introduce them to the bookstore.